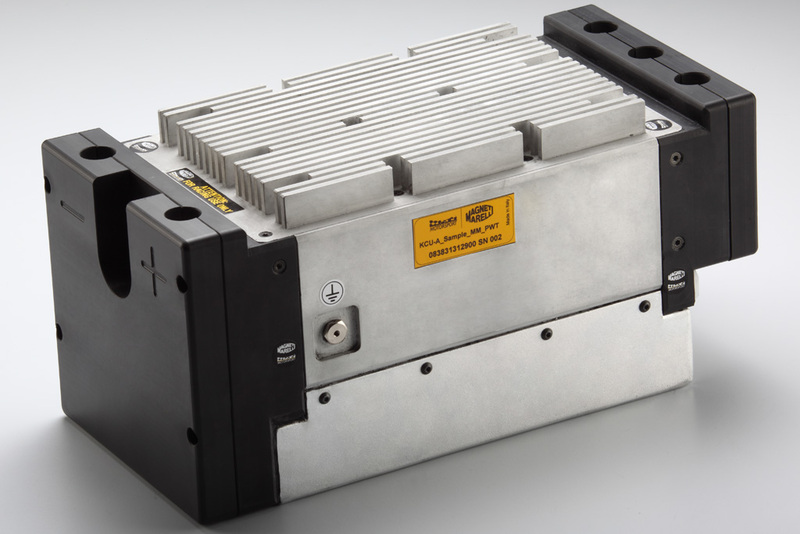 Magneti Marelli has been engaged for some years now in the development of power control systems for hybrid and electrical applications. In2009, the KERS system for the recovery of kinetic energy, developed by the motorsport sector, made its debut in Formula 1. The DC/DC converter is the electronic control unit connected to the two batteries fitted on the vehicle, with low voltage (12V conventional) and high voltage (up to 500V). Two-way, in other words capable of transferring energy between the two batteries, in both directions (Step-Up and Step-Down). Efficiency between 90% and 95%, depending on the load and on vehicle conditions. Resistance to thermal and mechanical cycles requested by automotive applications, in order to guarantee 10 years of useful life 300,000 km. The operating currents (up to 1000 A) and voltages (up to 500V) represent an absolute innovation for automotive applications.